Parkinson’s disease is a neurodegenerative disorder that makes it increasingly difficult for seniors to control their muscles. The tremors, muscle stiffness, and other involuntary movements can make daily life challenging, but there are many ways for seniors to manage Parkinson’s symptoms. These tips can alleviate discomfort and make it easier for a senior to carry out daily tasks. You can help your senior loved one keep his or her muscles strong and flexible by regularly assisting with exercise. Your loved one can do basic things like a gentle walk, a slow swim, or a seated flexibility routine, or you can ask a physical therapist about exercises specifically for Parkinson’s. 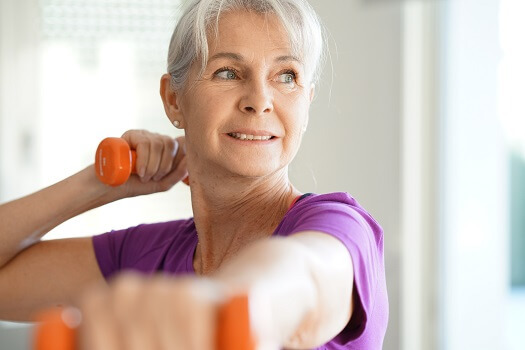 Exercising does not cure the movement issues of Parkinson’s, but it can help your loved one maintain balance, prevent falls, and compensate for stiffness. Seniors living with Parkinson’s disease often need help managing their daily tasks. Montgomery respite care professionals can assist seniors with a wide array of daily tasks, offering family caregivers the chance to focus on other personal responsibilities or take a break to prevent burnout. Whether it’s for a few hours a day or a few days a week, respite care is the perfect solution for family caregivers who are feeling overwhelmed. Make sure to help your loved one manage his or her medications. Currently, levodopa is considered the most effective medication for managing Parkinson’s symptoms. Levodopa converts to dopamine within the brain, and the higher levels of dopamine halt most of the symptoms associated with Parkinson’s disease. Levodopa is sometimes combined with carbidopa to keep it from turning to dopamine before it reaches the brain. Other medications include dopamine agonists that mimic the effect of dopamine in the brain and inhibitors that block the enzymes responsible for breaking down dopamine. Seniors often require reminders to take their medications. If your senior loved one needs help managing an illness or assistance with daily tasks, make sure you choose a top-rated provider of home care. Montgomery Home Care Assistance is here to help your loved one live a happier and healthier life in the golden years. From the mentally stimulating activities in our Cognitive Therapeutics Method to our friendly Care Managers who are available to answer your questions 24 hours a day, we offer a wide array of high-quality at-home care services. There are many tips and tricks for addressing lowered voices, muscle stiffness, and handwriting difficulties. For example, marching in place for a moment can help your loved one resume forward walking after a freeze, and singing may help him or her regain control of vocal chords. Treatment from a specialist who focuses on movement disorders can provide plenty of management methods that may make daily life easier for your loved one. You may want to talk to your loved one’s doctor about more aggressive treatment options. Deep brain stimulation is a type of surgery that can alleviate symptoms in late-stage Parkinson’s disease. It involves implanting electrodes in the brain to send tiny electrical pulses throughout the brain. Deep brain stimulation can reduce tremors, involuntary movements, and slowed movements as well as an unstable response to medication, so even seniors in late-stage Parkinson’s can still gain benefits from levodopa and other medications. There are many new technological advances designed to make life easier for seniors with Parkinson’s disease. You can find utensils and pens with stabilizers that reduce the effects of a tremor while your loved one uses them. Many seniors find listening to music helps them walk more evenly. Give your loved one a discreet Bluetooth headset that plays his or her favorite tunes. If your loved one is still living at home, you may want to install devices like grab bars to prevent falls. Caring for a senior loved one can be challenging for families who don’t have expertise or professional training in home care, but this challenge doesn’t have to be faced alone. Family caregivers can turn to Montgomery Home Care Assistance for the help they need. We provide high-quality live-in and respite care as well as comprehensive Alzheimer’s, dementia, stroke, and Parkinson’s care. Call (334) 593-3988 today to speak with one of our knowledgeable Care Managers.